Just as it is licit to resist a Pontiff who attacks the body, so also is it licit to resist him who attacks souls or destroys the civil order or above all, tries to destroy the Church. I say that it is licit to resist him by not doing what he orders and by impeding the execution of his will. It is not licit, however, to judge him, to punish him, or to depose him, for these are acts proper to a superior. The book from which this quote is taken, De Romano Pontifice (“On the Roman Pontiff”), has recently been translated into English by Fr. Kenneth Baker, S.J. (available here) and also by Mr. Ryan Grant (available here). The same passage in Bellarmine — we have also been told — shoots down the principle behind sedevacantism (that a heretical pope automatically loses his office) because sedevacantists “judge” and “depose” the pope. These conclusions, it turns out, are simply another example of how low intellectual standards in traditionalist polemics give birth to myths that quickly take on the aura of near-revealed truths. (1) Bellarmine is talking about a morally evil pope who gives morally evil commands — not one who, like the post-Vatican II popes, teaches doctrinal error or imposes evil laws. (2) The context of the statement is a debate over the errors of Gallicanism, not the case of a heretical pope. (3) Bellarmine is justifying “resistance” by kings and prelates, not by individual Catholics. (4) Bellarmine teaches in the next chapter of his work (30) that a heretical pope automatically loses his authority. In a word, the passage can neither be applied to the present crisis nor invoked against sedevacantism. A brief comment on each of these four points is in order. 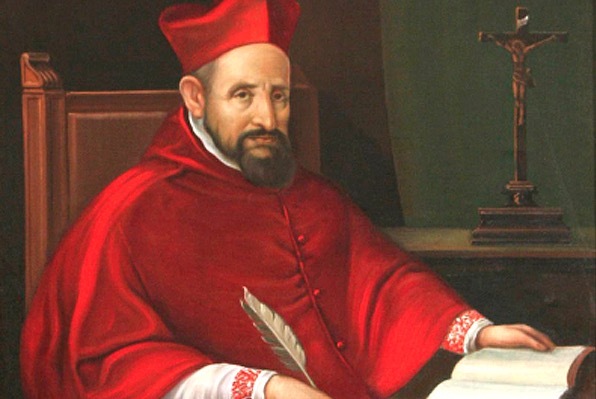 Now that the entire De Romano Pontifice is available in English, people are able for themselves to see the full context in which Cardinal Bellarmine was speaking, and what he was and was not saying. The reason we are bringing this topic up again at this time is that as of late, the Bellarmine resistance quote has been making the rounds again as the Bergoglian circus in the Vatican is reaching a fever pitch. In particular, the well-known recognize-and-resist polemicist Christopher Ferrara is fond of (mis)using the Bellarmine quote (latest case in point here), treating it as a blank check that allows him to blast Francis for anything he can while still maintaining that he is the Vicar of Christ — clearly the best of both worlds. Yet, why we should feel bound to accept the teaching of Cardinal Bellarmine while at the same time we are being asked to ignore and reject the teachings of a putative ecumenical council and a whole line of supposedly true Popes, is curiously never explained. The Pope is the Teacher and Shepherd of the whole Church, thus, the whole Church is so bound to hear and follow him that if he would err, the whole Church would err. Now our adversaries respond that the Church ought to hear him so long as he teaches correctly, for God must be heard more than men. On the other hand, who will judge whether the Pope has taught rightly or not? For it is not for the sheep to judge whether the shepherd wanders off, not even and especially in those matters which are truly doubtful. Nor do Christian sheep have any greater judge or teacher to whom they might have recourse. As we showed above, from the whole Church one can appeal to the Pope yet, from him no one is able to appeal; therefore necessarily the whole Church will err if the Pontiff would err. Unfortunately, to our knowledge this quotation has never made it into the propaganda put out by the Society of St. Pius X, The Remnant, the Fatima Center, Catholic Family News, The Angelus, or any other of the self-appointed doctrinal babysitters of the supposed Holy See. Once again St. Robert Bellarmine has come to the defense of Sedevacantism. The reason for this is quite simply that Sedevacantism is nothing but Catholic principles applied to the strange times in which we live. That the Chair of St. Peter is vacant is simply a necessary conclusion at which we must ultimately arrive, given the incontrovertible empirical facts about the Modernist papal claimaints and the strange new church that has emerged since the death of Pope Pius XII in 1958. On his blog Abyssus Abyssum Incovat (“Deep calls on deep”; cf. Ps 41:8), the 94-year-old retired “bishop” of Corpus Christi, Texas, Fr. René Henry Gracida, has published a post calling for all remaining “legitimate cardinals” to get together and elect a Pope. This news story is huge. So, what happens if a group of Cardinals who undoubtedly did notparticipate in any acts of disobedience against Universi Dominici Gregis were to meet, confer and declare that, pursuant to Universi Dominici Gregis, Monsignor Bergoglio is most certainly not a valid Roman Pontiff. Like any action on this matter, including the initial finding of invalidity, that would be left to the valid members of the college of cardinals. They could declare the Chair of Peter vacant and proceed to a new and proper conclave. They could meet with His Holiness, Benedict XVI, and discern whether His resignation and retirement was made under duress, or based on some mistake or fraud, or otherwise not done in a legally effective manner, which could invalidate that resignation. Given the demeanor of His Holiness, Benedict XVI, and the tenor of His few public statements since his departure from the Chair of Peter, this recognition of validity in Benedict XVI seems unlikely. In fact, even before a righteous group of good and authentic cardinals can decide on the validity of the March 2013 supposed conclave, they must face what may be an even more complicated discernment and decide which men are most likely not valid cardinals. If a man was made a cardinal by the supposed Pope who is, in fact, not a Pope (but merely Monsignor Bergoglio), no such man is in reality a true member of the College of Cardinals. In addition, those men appointed by Pope John Paul II or by Pope Benedict XVI as cardinals, but who were latae sententiae excommunicated because of illegal acts or conduct causing the invalidation of the last attempted conclave, would no longer have voting rights in the College of Cardinals either. The actual valid members in the College of Cardinals may be quite smaller in number than those on the current official Vatican list of supposed cardinals. Although the author of the post, mentioned at the end, bears a pseudonym and is therefore essentially anonymous, it is clear that Fr. Gracida agrees with him since he has himself published the text (it is Gracida’s blog, after all). We may surmise that the Novus Ordo news organs will try to ignore this as much as possible and simply hope that the almost-95-year-old will soon stop blogging for biological reasons. They have nothing to gain and much to lose by reporting on this. Just to avoid any doubt or misunderstanding: Yes, “Bishop” René Gracida is officially a part of the Vatican II Church, and he is in good standing to boot. You can find information about him on the diocesan web site here. We are not talking about some whacko whom the Novus Ordo Sect doesn’t recognize or approve of. Gracida was ordained a priest for the Benedictine order on May 23, 1959, so he is definitely a valid priest. In 1971, “Pope” Paul VI appointed him bishop, and he received “episcopal consecration” in the invalid Novus Ordo rite on Jan. 25, 1972 (source). In September of 2017, Gracida welcomed the explosive (but now largely forgotten) “Filial Correction” of Francis and was among the first to ask publicly for his name to be added to it as a signatory. As Bergoglio’s heterodoxy has become less and less deniable over the past years, more and more people have begun to speak out against this “Pope” in one way or another. For example, the Colombian TV personality, politician, and university president José Galat has publicly called attention to some of Francis’ heresies on national television and stated that he does not believe him to be a true Pope. More and more books critical of or downright hostile to Francis have been appearing (think Antonio Socci, George Neumayr, Phil Lawler, Ross Douthat, and Henry Sire, for example), and in October of 2017, a Novus Ordo priest admitted in a newspaper article that when it comes to Francis, “we can’t wait for him to die”. For a few years now we have warned of an intra-NovusOrdo schism, a split within the Vatican II Sect, that would divide the pseudo-Catholic church into two camps: the open Modernists on the one hand, and the more obscure Modernists (who believe themselves to be conservative Catholics) on the other. The former would be officially united under Francis, whereas the latter either would have the “Pope Emeritus” on their side (Benedict XVI) or else choose someone like “Cardinal” Raymond Burke as their front man. Absent such a person, they would, in any case, claim to be the true heirs of the Magisterium of Benedict XVI and John Paul II. Whether “Bp.” Gracida’s call for a conclave, which would obviously cause a schism, will go anywhere, is highly doubtful. However, that’s not even the point. The point is that never before since Francis usurped the papal throne in 2013 has a member of the Novus Ordo hierarchy gone so far as Fr. Gracida now has. What will happen next? Let’s make popcorn and see. In its English translation, the new infernal exhortation Gaudete et Exsultate counts just over 22,000 words. We have read the text in its entirety so you don’t have to. You’re welcome. Whether “Pope” Francis has read the text yet or not, we are not sure — Vaticanist Sandro Magister suspects that the document was written mainly by Bergoglio’s bosom buddy “Fr.” Antonio Spadaro, the man of “ecumenism of hate” fame. In any case, we have compiled what we believe to be the most important quotes from Gaudete et Exsultate in the bulleted list below, as a companion to our Gaudete info page here. The number at the beginning of each quote indicates the numbered paragraph in the text at which it can be found. Each bulleted item does not necessarily constitute the entirety of the numbered paragraph from which it is taken. We are never completely ourselves unless we belong to a people. That is why no one is saved alone, as an isolated individual. Rather, God draws us to himself, taking into account the complex fabric of interpersonal relationships present in a human community. Here I would like to mention two false forms of holiness that can lead us astray: gnosticism and pelagianism. They are two heresies from early Christian times, yet they continue to plague us. In our times too, many Christians, perhaps without realizing it, can be seduced by these deceptive ideas, which reflect an anthropocentric immanentism disguised as Catholic truth. Let us take a look at these two forms of doctrinal or disciplinary security that give rise “to a narcissistic and authoritarian elitism, whereby instead of evangelizing, one analyses and classifies others, and instead of opening the door to grace, one exhausts his or her energies in inspecting and verifying. In neither case is one really concerned about Jesus Christ or others”. A dangerous confusion can arise. We can think that because we know something, or are able to explain it in certain terms, we are already saints, perfect and better than the “ignorant masses”. Saint John Paul II warned of the temptation on the part of those in the Church who are more highly educated “to feel somehow superior to other members of the faithful”. Underneath our orthodoxy, our attitudes might not correspond to our talk about the need for grace, and in specific situations we can end up putting little trust in it. Unless we can acknowledge our concrete and limited situation, we will not be able to see the real and possible steps that the Lord demands of us at every moment, once we are attracted and empowered by his gift. Grace acts in history; ordinarily it takes hold of us and transforms us progressively. If we reject this historical and progressive reality, we can actually refuse and block grace, even as we extol it by our words. In other words, amid the thicket of precepts and prescriptions, Jesus clears a way to seeing two faces, that of the Father and that of our brother. He does not give us two more formulas or two more commands. He gives us two faces, or better yet, one alone: the face of God reflected in so many other faces. For in every one of our brothers and sisters, especially the least, the most vulnerable, the defenceless and those in need, God’s very image is found. These are strong words in a world that from the beginning has been a place of conflict, disputes and enmity on all sides, where we constantly pigeonhole others on the basis of their ideas, their customs and even their way of speaking or dressing. Ultimately, it is the reign of pride and vanity, where each person thinks he or she has the right to dominate others. We need to think of ourselves as an army of the forgiven. We often hear it said that, with respect to relativism and the flaws of our present world, the situation of migrants, for example, is a lesser issue. Some Catholics consider it a secondary issue compared to the “grave” bioethical questions. That a politician looking for votes might say such a thing is understandable, but not a Christian, for whom the only proper attitude is to stand in the shoes of those brothers and sisters of ours who risk their lives to offer a future to their children. Can we not realize that this is exactly what Jesus demands of us, when he tells us that in welcoming the stranger we welcome him (cf. Mt 25:35)? I am not saying that such humiliation is pleasant, for that would be masochism, but that it is a way of imitating Jesus and growing in union with him. So if we dare to go to the fringes, we will find [God] there; indeed, he is already there. Jesus is already there, in the hearts of our brothers and sisters, in their wounded flesh, in their troubles and in their profound desolation. He is already there. True enough, we need to open the door of our hearts to Jesus, who stands and knocks (cf. Rev 3:20). Sometimes I wonder, though, if perhaps Jesus is already inside us and knocking on the door for us to let him escape from our stale self-centredness. We need to remember that “contemplation of the face of Jesus, died and risen, restores our humanity, even when it has been broken by the troubles of this life or marred by sin. We must not domesticate the power of the face of Christ”. If we realize that God exists, we cannot help but worship him, at times in quiet wonder, and praise him in festive song. True enough, the biblical authors had limited conceptual resources for expressing certain realities, and in Jesus’ time epilepsy, for example, could easily be confused with demonic possession. Yet this should not lead us to an oversimplification that would conclude that all the cases related in the Gospel had to do with psychological disorders and hence that the devil does not exist or is not at work. He is present in the very first pages of the Scriptures, which end with God’s victory over the devil. Hence, we should not think of the devil as a myth, a representation, a symbol, a figure of speech or an idea. This mistake would lead us to let down our guard, to grow careless and end up more vulnerable. The devil does not need to possess us. He poisons us with the venom of hatred, desolation, envy and vice. Spiritual corruption is worse than the fall of a sinner, for it is a comfortable and self-satisfied form of blindness. Everything then appears acceptable: deception, slander, egotism and other subtle forms of self-centredness, for “even Satan disguises himself as an angel of light” (2 Cor 11:14). Discernment, then, is not a solipsistic self-analysis or a form of egotistical introspection, but an authentic process of leaving ourselves behind in order to approach the mystery of God, who helps us to carry out the mission to which he has called us, for the good of our brothers and sisters. [Fn. 73] Detraction and calumny are acts of terrorism: a bomb is thrown, it explodes and the attacker walks away calm and contented. This is completely different from the nobility of those who speak to others face to face, serenely and frankly, out of genuine concern for their good. For the purposes of this post, we will leave all these passages uncommented. The Vatican’s endless word factory has just released another monster of a document: Jorge Bergoglio (a.k.a. “Pope Francis”) has released his third-so called Apostolic Exhortation, and just like the other two, it has a cognate of “joy” in its title: Gaudete and Exsultate (“Rejoice and Be Glad”), taken from the words of Christ in the Beatitudes (Mt 5:12) follows Amoris Laetitia (“The Joy of Love”) and Evangelii Gaudium (“The Joy of the Gospel”). We can assume that no document on the threat of damnation for unrepentant sinners, perhaps entitled Discedite a Me Maledicti (“Depart from me, you cursed”; Mt 25:41), will be forthcoming any time soon, at least not before the U.S. government pays off the national debt. Time and again we hear the objection, typically made by those who try to justify their pathological refusal to countenance Sedevacantism, that St. Peter denied Christ three times (see Mt 26:69-75) and didn’t thereby cease to be Pope. Ergo, so we are asked to believe, it is absurd to say that Francis is not the Pope just because he is not a Catholic and continually disseminates heresy. Although the first two points are important, it is the third that refutes the objection definitively, since the objection cannot have any merit against Sedevacantism whatsoever if Peter was not already Pope when he denied Christ during His Sacred Passion. So we teach and declare that according to the testimonies of the Gospel the primacy of jurisdiction over the entire Church of God was promised and was conferred immediately and directly upon the blessed Apostle Peter by Christ the Lord. For the one Simon, to whom He had before said: “Thou shalt be called Cephas” [John 1:42], after he had given forth his confession with those words: “Thou art Christ, Son of the living God” [Matt. 16:16], the Lord spoke with these solemn words: “Blessed art thou, Simon Bar Jona; because flesh and blood hath not revealed it to thee, but my Father who is in heaven. And I say to thee: That thou art Peter, and upon this rock I will build my church, and the gates of hell shall not prevail against it: and I shall give to thee the keys of the kingdom of heaven. And whatsoever thou shalt bind upon earth, it shall be bound also in heaven: and whatsoever thou shalt loose upon earth, it shall be loosed also in heaven” [Matt. 16:17 ff.]. And upon Simon Peter alone Jesus after His resurrection conferred the jurisdiction of the highest pastor and rector over his entire fold, saying: “Feed my lambs,” “Feed my sheep” [John 21:15 ff.]. To this teaching of Sacred Scriptures, so manifest as it has been always understood by the Catholic Church, are opposed openly the vicious opinions of those who perversely deny that the form of government in His Church was established by Christ the Lord; that to Peter alone, before the other apostles, whether individually or all together, was confided the true and proper primacy of jurisdiction by Christ; or, of those who affirm that the same primacy was not immediately and directly bestowed upon the blessed Peter himself, but upon the Church, and through this Church upon him as the minister of the Church herself. It is a common misconception to think that Christ conferred the primacy on St. Peter in Mt 16:18. He did not; He merely announced that he would do so at some future point: “And I say to thee: That thou art Peter; and upon this rock I will build my church, and the gates of hell shall not prevail against it. And I will give to thee the keys of the kingdom of heaven…” (Mt 16:18-19). In fact, we can see that our Lord specifically did not enjoin upon Simon Peter the papal task of confirming his brethren (cf. Denz. 1836) until after his “conversion”, that is, not before he had repented of his denial: “And the Lord said: Simon, Simon, behold Satan hath desired to have you, that he may sift you as wheat: But I have prayed for thee, that thy faith fail not: and thou, being once converted, confirm thy brethren” (Lk 22:31-32). Another and a certain privilege was common to Peter with all his successors, that he and all the other bishops of Rome (for Peter, as Christ willed, founded and confirmed the Pontifical Church at Rome), should never openly fall from this faith, so as to teach the Church heresy, or any error, contrary to the faith. So S. Leo (serm. xxii), on Natalis of SS. Peter and Paul; S. Cyprian (Lib. i. ep. 3), to Cornelius; Lucius I., Felix I., Agatho, Nicolas I., Leo IX., Innocent III., Bernard and others, whom Bellarmine cites and follows (Lib. i. de Pontif. Roman). For it was necessary that Christ, by His most wise providence, should provide for His Church, which is ever being sifted and tempted by the devil, and that not only in the time of Peter, but at all times henceforth, even to the end of the world, an oracle of the true faith which she might consult in every doubt, and by which she might be taught and confirmed in the faith, otherwise the Church might err in faith, quod absit [which God forbid]! For she is, as S. Paul said to Timothy, “the pillar and ground of the truth” (1 Tim. iii. 15). This oracle of the Church then is Peter, and all successive bishops of Rome. This promise made to Peter and his successors, most especially applies to the time when Peter, as the successor of Christ, began to be the head of the Church, that is, after the death of Christ. And when thou art converted, strengthen thy brethren. “From the sifting of Satan, that is from his temptation and from the sin by which thou wilt deny Me; for by this thou wilt be turned aside from Me, and My grace and love.” So Euthymius, Theophylact, Jansen, F. Lucas, and others. Could it be any clearer that the only way that Francis is able to do what he does is because he is not the Pope of the Catholic Church and therefore does not possess the prerogatives and protections promised by Christ to St. Peter and his successors? And thus we see that the objection that Sedevacantism must be rejected because St. Peter denied Christ three times and still remained Pope, is false. After giving the world a Naturalist Lent, now that Lent is over, “Pope” Francis wasted no time in ushering in an equally Naturalist Easter: For his address at the traditional Urbi et Orbi blessing on Easter Sunday, Apr. 1, the Jesuit Antipope used the occasion of the celebration of the Resurrection of Christ to focus everyone’s thoughts immediately on the temporal concerns of the world once again. In other words, it’s business as usual for Francis; it’s just that this time he is using Christ’s Resurrection to promote his Naturalism. The message continues with more of the same, talking about conflicts, hunger, dialogue, solidarity, etc. — the same endless stuff you hear about from Francis constantly and ad nauseam. And thus Jorge Bergoglio has once again confirmed our thesis, enunciated time and again on this blog, that for him the supernatural is only used as a stepping stone to promote the natural. In doing so, he does the exact opposite of the Lord Jesus Christ, who used worldly and natural cares as an impulse to raise souls to a higher plane and communicate a supernatural truth with the intent to save them from eternal punishment in hell. For example, we see our Lord acting this way in His feeding of the five thousand. He satisfies their natural hunger for the moment but uses the occasion to preach to them about the Bread of Life (see John 6). Another example would be the conversation Jesus had with the Samaritan woman at the well (see John 4). Her concern is a natural one: She is drawing water from the well so that she and her household will be able to drink. This concern is entirely legitimate of course — we all need to drink — but it is natural: It concerns the corruptible body, not the immortal soul. Even though she needs water to drink, the day will come when she will die, and no water in the world can prevent that day from approaching. If she dies without being reconciled to her Creator, she will be punished eternally for her guilt, and her entire natural life, with all its water, food, and other physical necessities and amenities, will have been in vain. There cometh a woman of Samaria, to draw water. Jesus saith to her: Give me to drink. For his disciples were gone into the city to buy meats. Then that Samaritan woman saith to him: How dost thou, being a Jew, ask of me to drink, who am a Samaritan woman? For the Jews do not communicate with the Samaritans. Jesus answered, and said to her: If thou didst know the gift of God, and who he is that saith to thee, Give me to drink; thou perhaps wouldst have asked of him, and he would have given thee living water. The woman saith to him: Sir, thou hast nothing wherein to draw, and the well is deep; from whence then hast thou living water? Art thou greater than our father Jacob, who gave us the well, and drank thereof himself, and his children, and his cattle? Jesus answered, and said to her: Whosoever drinketh of this water, shall thirst again; but he that shall drink of the water that I will give him, shall not thirst for ever: But the water that I will give him, shall become in him a fountain of water, springing up into life everlasting. The woman saith to him: Sir, give me this water, that I may not thirst, nor come hither to draw. Jesus saith to her: Go, call thy husband, and come hither. The woman answered, and said: I have no husband. Jesus said to her: Thou hast said well, I have no husband: For thou hast had five husbands: and he whom thou now hast, is not thy husband. This thou hast said truly. The woman saith to him: Sir, I perceive that thou art a prophet. Our fathers adored on this mountain, and you say, that at Jerusalem is the place where men must adore. Jesus saith to her: Woman, believe me, that the hour cometh, when you shall neither on this mountain, nor in Jerusalem, adore the Father. You adore that which you know not: we adore that which we know; for salvation is of the Jews. But the hour cometh, and now is, when the true adorers shall adore the Father in spirit and in truth. For the Father also seeketh such to adore him. God is a spirit; and they that adore him, must adore him in spirit and in truth. The woman saith to him: I know that the Messias cometh (who is called Christ). Therefore, when he is come, he will tell us all things. Jesus saith to her: I am he, who am speaking with thee. In this beautiful way, Our Lord approaches sinners and draws them to Him. Those who are preoccupied with the affairs of this world He lifts up to introduce them to a much greater and more significant reality: their eternal destinies. So, while temporal concerns can be quite legitimate, of course, they must ultimately yield to the greater and more important concerns of the soul. Francis takes this approach and turns it on its head. In the example of his Easter message quoted above, he takes the Resurrection of Christ and uses it as an occasion to quickly focus everyone’s minds quickly on the concerns of the temporal world. Yet Christ Jesus taught us: “Labour not for the meat which perisheth, but for that which endureth unto life everlasting” (Jn 6:27); and, “That which is born of the flesh, is flesh; and that which is born of the Spirit, is spirit” (Jn 3:6); and, “It is the spirit that quickeneth: the flesh profiteth nothing” (Jn 6:64). He who remains focused on the natural, the mundane, the temporal, will ultimately only receive death: “For what things a man shall sow, those also shall he reap. For he that soweth in his flesh, of the flesh also shall reap corruption. But he that soweth in the spirit, of the spirit shall reap life everlasting” (Gal 6:8). And he said to his disciples: Therefore I say to you, be not solicitous for your life, what you shall eat; nor for your body, what you shall put on. The life is more than the meat, and the body is more than the raiment. Consider the ravens, for they sow not, neither do they reap, neither have they storehouse nor barn, and God feedeth them. How much are you more valuable than they? And which of you, by taking thought, can add to his stature one cubit? If then ye be not able to do so much as the least thing, why are you solicitous for the rest? Consider the lilies, how they grow: they labour not, neither do they spin. But I say to you, not even Solomon in all his glory was clothed like one of these. Now if God clothe in this manner the grass that is today in the field, and tomorrow is cast into the oven; how much more you, O ye of little faith? And seek not you what you shall eat, or what you shall drink: and be not lifted up on high. For all these things do the nations of the world seek. But your Father knoweth that you have need of these things. But seek ye first the kingdom of God and his justice, and all these things shall be added unto you. Fear not, little flock, for it hath pleased your Father to give you a kingdom. Sell what you possess and give alms. Make to yourselves bags which grow not old, a treasure in heaven which faileth not: where no thief approacheth, nor moth corrupteth. For where your treasure is, there will your heart be also. Here we again see Christ teaching supernatural truths by means of natural created things: ravens, lilies, moths, etc. Christ put the natural at the service of the supernatural, whereas Francis puts the supernatural at the service of the natural. Bergoglio inverts the Lord Jesus Christ and thereby preaches the anti-gospel of the Antichrist, whoever the latter will eventually turn out to be. Keep in mind this important insight: Oftentimes Francis will deceive, not by stating heresies or other falsehoods clearly and directly — although he does that too on occasion — but by stating things that are true if taken in isolation but that, given the context, are causing a false impression in the hearer. By means of ambiguity, contradiction, carefully selective emphasis, omission of things he ought to say, excessive focus on a particular subject, etc., he communicates in such a way that although most of the things he says may not be false, or at least not clearly so, if considered in themselves, nevertheless his audience will take heresy or other error from what he says. That is the most diabolical and wicked way to poison souls, and it explains why Francis rarely ever speaks clearly but instead loves to hide behind metaphors, ambiguity and vagueness, and a flood of words. [Our predecessors] knew the capacity of innovators in the art of deception. In order not to shock the ears of Catholics, the innovators sought to hide the subtleties of their tortuous maneuvers by the use of seemingly innocuous words such as would allow them to insinuate error into souls in the most gentle manner. Once the truth had been compromised, they could, by means of slight changes or additions in phraseology, distort the confession of the faith that is necessary for our salvation, and lead the faithful by subtle errors to their eternal damnation. This manner of dissimulating and lying is vicious, regardless of the circumstances under which it is used. For very good reasons it can never be tolerated in a synod of which the principal glory consists above all in teaching the truth with clarity and excluding all danger of error. It is as if the innovators pretended that they always intended to present the alternative passages, especially to those of simple faith who eventually come to know only some part of the conclusions of such discussions, which are published in the common language for everyone’s use. Or again, as if the same faithful had the ability on examining such documents to judge such matters for themselves without getting confused and avoiding all risk of error. It is a most reprehensible technique for the insinuation of doctrinal errors and one condemned long ago by our predecessor St. Celestine who found it used in the writings of Nestorius, bishop of Constantinople, and which he exposed in order to condemn it with the greatest possible severity. Once these texts were examined carefully, the impostor was exposed and confounded, for he expressed himself in a plethora of words, mixing true things with others that were obscure; mixing at times one with the other in such a way that he was also able to confess those things which were denied while at the same time possessing a basis for denying those very sentences which he confessed. In order to expose such snares, something which becomes necessary with a certain frequency in every century, no other method is required than the following: Whenever it becomes necessary to expose statements that disguise some suspected error or danger under the veil of ambiguity, one must denounce the perverse meaning under which the error opposed to Catholic truth is camouflaged. One way in which Francis deceives souls and makes them imbibe heresy and error is by means of his excessive focus on the corporal works of mercy, almost to the complete exclusion of the spiritual works of mercy. Yet it is the spiritual works which are in themselves more excellent and important than the corporal works, as they have the good of the soul as their primary object (cf. Catholic Encyclopedia on the Works of Mercy). Promoting the corporal works of mercy is not wrong; in fact, it is necessary (see Mt 25:31-46). But Francis does it to such an excessive extent and to the almost complete exclusion of the spiritual works that he gives the impression that the ultimate goal of the Catholic religion is the feeding of and caring for bodies, when the fact is that her mission is to save souls from hell (see Mk 16:15-16). Christ warned us: “And fear ye not them that kill the body, and are not able to kill the soul: but rather fear him that can destroy both soul and body in hell” (Mt 10:28). Although [the Modernists] express their astonishment that We should number them amongst the enemies of the Church, no one will be reasonably surprised that We should do so, if, leaving out of account the internal disposition of the soul, of which God alone is the Judge, he considers their tenets, their manner of speech, and their action. Nor indeed would he be wrong in regarding them as the most pernicious of all the adversaries of the Church. Francis is popular with the world because, like them, he is of the world, not merely in it (cf. Jn 17:14-16). He is one of them. In fact, he is just like those false teachers denounced by St. John the Evangelist in his First Epistle: “They are of the world: therefore of the world they speak, and the world heareth them” (1 Jn 4:5). Yes, Francis does talk about preaching the Gospel all the time, but he preaches a humanitarian gospel of man, not the Gospel of Christ (cf. Gal 1:8-9). When he must talk about a supernatural truth of the Gospel — for example, if the Gospel passage of the day’s liturgy plainly teaches a supernatural truth he cannot easily get around or distort — then he blasphemously misuses that supernatural truth as a gimmick to advance his false Naturalist gospel, as was evident this past Easter Sunday. The Resurrection of Christ, the Pope said, has made the novelty of dialogue and of the relationship explode in the world, a novelty that has become “a responsibility for Christians”. He recalled Jesus telling that the world would come know they were his disciples from their love for one another. This is why, the Pope explained, we cannot close ourselves in our privacy, in our group, but we are called to take care of the common good, to take care of our brothers, especially the weakest and most marginalized. Only fraternity, the Pope stressed, can guarantee lasting peace, defeat poverty, extinguish tensions and wars, and can eradicate corruption and crime. The Pope concluded urging all to implore the Virgin Mary help all make fraternity and communion their lifestyle and the soul of their relationships. So there we go yet again: Without stating it explicitly, Francis continually causes the impression — by means of excessive focus and emphasis — that all supernatural truths — in this case, the Resurrection — are meant as an impetus for us to make this world a better place. This is a message the “prince of this world” (Jn 14:30) does not have a problem with, because its goal is not the salvation of souls. By eclipsing and distorting the true Gospel, this false gospel will only lead souls to their eternal damnation.